Preheat olive oil in a large pan and add the diced onion and garlic. Fry them for a couple of minutes and add the sliced mushrooms with half of the tomatoes. Stir everything and leave for another 2-3 minutes. Add the rest of the tomatoes, the oregano, basil, salt and pepper. Saute everything together for another 10-15 min on low heat while you cook your pasta (don’t overcook it because it’s going in the oven afterwords). When the pasta is ready pour it in a baking dish and add some butter. Mix them together and add the tomato & mushroom sauce. Cover with the shredded formaggio and layer fresh mozzarella slices on top. Place in oven at 400 F/200 C for 15 about minutes to bake until cheese is melted. PS: If you want it and like it more saucy, add one can of tomato puree. Looks so yummy...great recipe...thanks for sharing! This looks AMAZING!! Thank you for sharing. I am hosting a link party going on right now. I'd love it if you came by & linked up! 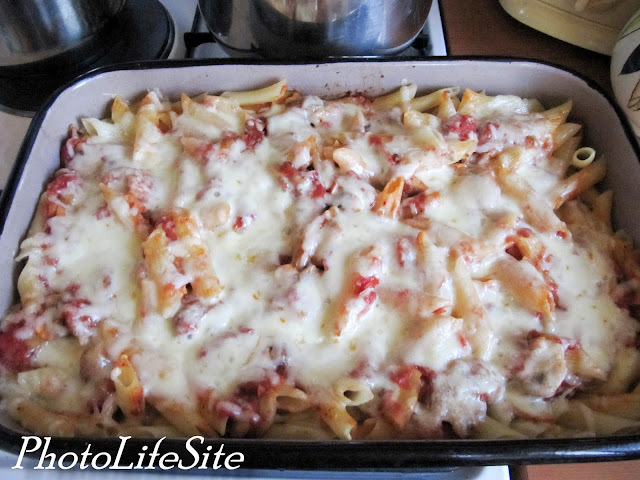 Sure looks good to me, but, I love almost any pasta mixed with tomatoes, sauce,puree, with cheese combo! maybe you could make a batch for us to try when you visit next? I'm a husband and a dad. I love to cook, travel, and take photos along the way. Thanks for stopping by! Photo Life Site. Powered by Blogger.